Al schedules from the famose el chepe train whitch passes 37 bridges and 86 tunnels from sea leavel up to 2400m were updated. This entry was posted in News and tagged Chepe, Chihuahua, Copper Canyon, Los Mochis, Mexico on 12/04/2019 by infobus. All timetables for Venezuelas trains updated. This entry was posted in News and tagged Barquisimeto, Caracas, Chivacoa, Cúa, schedule, Train, Venezuela on 10/04/2019 by infobus. Actualización de Horario de trenes en El Salvador y Honduras. 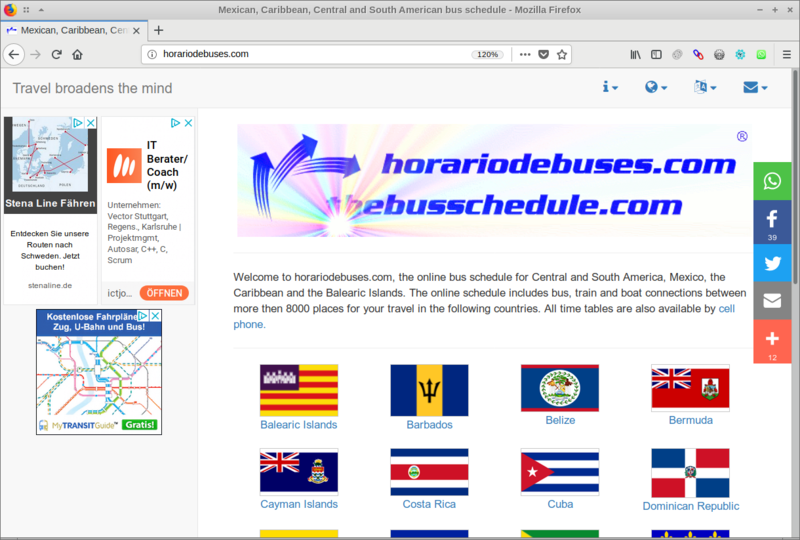 This entry was posted in News and tagged El Salvador, Honduras, horario, schedule, Train, tren on 05/04/2019 by infobus. horariodeferry.com fully new designed and updated. This entry was posted in News on 03/04/2019 by infobus. thebbusschedule.com launches it’s new design. All websites are now compatible with any device making it easier to access from fix and mobile terminals. Please be free to report any mistake. Any input is also welcome. This entry was posted in News, Pictures and tagged thebusschedule.com on 09/09/2018 by infobus. This entry was posted in News and tagged hashtag, thebusschedule on 09/12/2017 by infobus. Browser division on cell phone has been changed in the way that all Android and iOS smart phones will not been redirected to the mobile version any more. They will go to the normal main page. This entry was posted in News and tagged smartphones on 09/12/2017 by infobus. This entry was posted in News and tagged Bribri, Cahuita, Limon, Puerto Viejo, Sixaola, Valle la Estrella on 31/12/2015 by infobus. Adding all intercantonal Tracasa Lines in Limon Province. This entry was posted in News and tagged Batan, Guapiles, Limon, Matina, Siquires on 21/12/2015 by infobus. This entry was posted in News and tagged Cañas, Guanacste, Liberia, Quebrada, Upala on 21/12/2015 by infobus.